Yes, it's come to that point once again in which I need to ban myself from the blog in order to finish some non-book related projects. I'm thinking maybe around 2-3 months. As usual, I'm making it official with a post for my own sake so that I will stick to it. But I wanted to tie up a few loose ends first for the sake of peace of mind, and express my agony over a few things I'll be missing. 1. The Foundation Trilogy Readalong hosted by Carl of Stainless Steel Droppings has now ended, and what a great experience it has been. I loved the books, and the discussion has been wonderful. I had to take the book back to the library, and my memory has been especially bad lately, so my plan is just to read other posts but not do one of my own. I realized that I forgot what happened in two complete (and significant) chapters for the last group of questions, so who knows what I've wiped from my mind this time! 2. I will continue reading Clarissa as part of a year-long group read. I hope to jump back into the discussion by summer. 5. I've been tagged! It's been a few years since I've uttered that phrase. How fun! 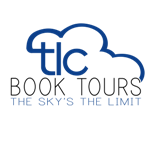 I'm sure you've seen this going around, and these questions are from Melissa at Avid Reader's Musings. 1. What's your favorite souvenir you've bought on a trip? I bought a world globe ornament when I was in Seattle last year that I love. I love globes and maps, and it's just cool looking. 2. How many times have you moved? Nine times. All in Southern California. 3. What movie should win the Best Picture Oscar this year? I'm really out of it when it comes to the Academy Awards. I usually have only seen like one movie that is nominated for Best Picture. And this year I'm not even sure what was nominated. But I think I know which one won. The Actor, or something like that. Am I right? Something about a silent film. 4. Do you have a dream job? What is it? 5. Favorite Girl Scout cookie? 6. Guilty pleasure TV show you watch? I'm going to have to go with Downton Abbey. Total high-brow soap. Especially Season 2 (which I'm not done with, so don't say anything about the end of the season!!!) 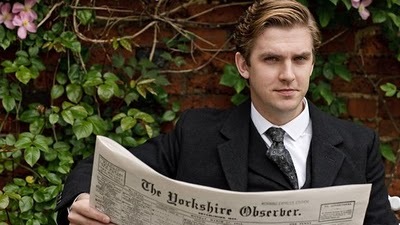 It's uber-dramatic, all over the place with the writing, but just give me a quick shot of Dan Stevens, and all becomes magic. 7. What question do you hate it when people ask you? This is a common one among book bloggers I think: "How do you have all that time to read all those books?" These days, I get in about an hour of reading a day, plus whatever audio book I'm listening to while I do various tasks. That doesn't sounds too excessive, does it? I know some people who don't even have time for that, but I also know people who watch a few hours of TV a day. And there's nothing wrong with that. But for some reason I never hear people asking each other, "How do you have all that time to watch all those TV shows?" 8. Your favorite pet you've ever owned? My German Shepherd Rootbeer that I had growing up. 9. What's the first book you remember reading? 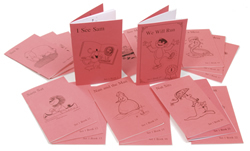 Did anyone else learn to read from the I See Sam series? I read through those when I was 3, so I guess those are the first. A picture book that stands out to me from a young age is Millions of Cats. First obsessive series--Chronicles of Narnia. 10. What's your favorite drink? Right now, Diet Coke Lime. I also love Sparkling Apple Grape Juice. 11. What's one thing on your Bucket List? I still have yet to make an official one, but I do have a chance to be in a Zumba flash mob, and I thought that sounded like a Bucket List item, but I wondered if it counted if I didn't really have it on my list first? I also don't know if I'll do it because I hate crowds. Which is kind of the whole thing of a flash mob. One of the reasons I haven't made a list yet is because when I think of things to put on the list, I just think, "Oh, I'd be okay if I didn't do that before I die." And so I never get anything down on the list. Wow, I'm boring! I guess I'd like to get my Bachelor's Degree, and maybe a Masters. And I'd like to serve in a soup kitchen. There. Three things on my list. I'm trying to not let it bug me that I have numbers within numbers here on this random post. There's just something very wrong about that, but it is what it is. And I'm sure I've forgotten something important. Have a great Spring everyone, and if I'm missing anything exciting, don't tell me about it!!! I have no willpower. A modern retelling of the beloved Jane Eyre? I was both intrigued and nervous when I began this novel. There's a certain audacity in such an attempt that prompts the reader to mentally dare the author to prove that they are somehow worthy of such task. "Have you got what it takes, Ms. Livesey? Can you justify this reincarnation of the irreplaceable Jane into the 20th century?" There was, of course, only one way to find out. The story begins with an air a familiarity for those who have read Jane Eyre--an orphan unloved and mistreated by her aunt and cousins, the transition to an austere boarding school, the death of her only friend, employment taking care of a lively young girl. It's so familiar, that it's almost hard to remember that we're in Scotland in the Sixties rather than 19th century England. 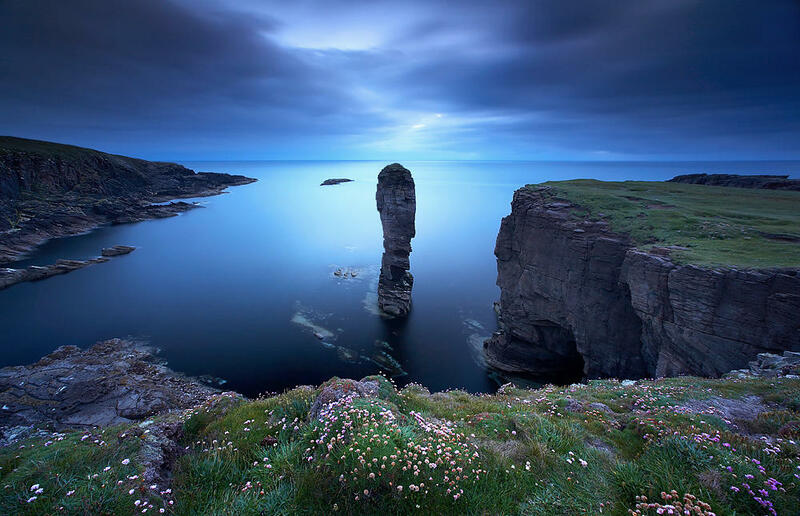 But once Gemma makes her way to the Orkney Islands, the setting becomes distinct (and breathtaking), as the story becomes something all its own. Gemma Hardy also becomes a distinct character from her Victorian counterpart. The power of Jane Eyre lies in a heroine that takes control of her life on her own terms, in contrast with the prevailing attitudes towards women at the time. While the contrast isn't as strong in our modern-day heroine, Gemma also becomes a woman directing her own course in life. Her own personal code of morality is formed throughout the novel, as secrets are revealed and questions about her origins are answered. In this moral code she sets herself apart from Jane, with a more modern viewpoint, of course, resulting in a somewhat different outcome. This outcome and the events leading up to it lack the deliciously Gothic intensity of the original Jane Eyre, but they were suspenseful in their own right, and warranted some vigorous page-turning. If I could ask for something more from the novel, it would be a stronger presence from Mr. Sinclair, Gemma's employer-turned-love interest. I also would have liked for the author to have delved more into the mysterious, supernatural aspects of the story. I expected something more. But perhaps she meant for them to remain ambiguous. In the end, do I feel that Ms. Livesey proved that she could accomplish the feat of reinventing one of my favorite novels of all time? Well, the book entertained me, swept me away to a different place and time, and made me think about my own moral compass. I would call that a success. Although I've tried really hard to keep this review serious, I can't help but end with an apt food comparison. (What can I say? Food and books. Is there anything else to life?) I love both store-bought Chips Ahoy cookies and homemade chocolate chip cookies. When I want to enjoy a satisfying crunch with minimal effort, I'll grab the Chips Ahoy. If I want warm, gooey, right-out-of the oven cookies, I'll take some time to gather the ingredients, mix up a batch, and wait that ten minutes for them to bake. The Flight of Gemma Hardy is like those fabulous Chips Ahoy cookies, and Jane Eyre is more like homemade. Very different, but delicious. And no calories. 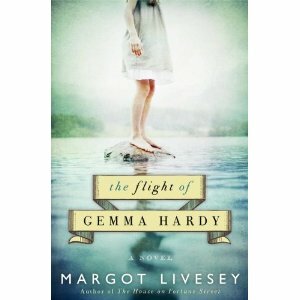 For more reviews of The Flight of Gemma Hardy, check here.